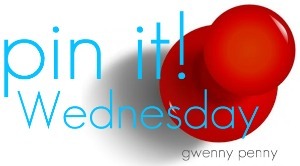 Today I am starting a new feature on my blog called "Pin It Wednesday". I already told you about my Pinterest obsession. I've decided it might be fun to start sharing some of the neat stuff I find on Pinterest every week. 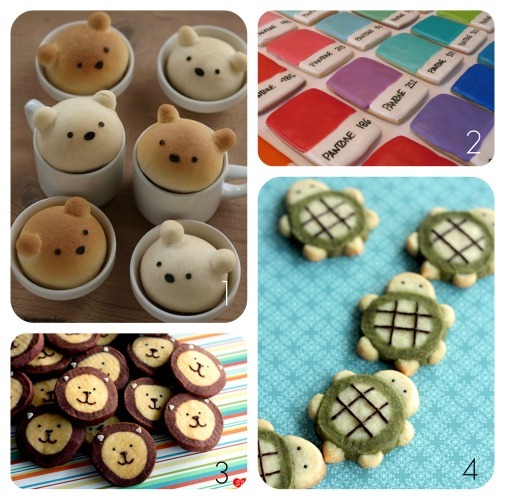 To kick things off, today's theme is "cute food", and by "cute food" I mean squeal-with-delight-adorable food. Think you can handle it? I warned you! Unbelievable cuteness. The bread bears are from a Japanese blog, Happy Rainbow. Unfortunately, the translator doesn't help much as far as instructions go. I would think they would be easy enough to figure out if you played around with some bread dough. The amazing Pantone chip cookies are by Kim at Cures for Boredom. She provides tips for creating and decorating these cookies yourself. The lion and turtle icebox cookies come from Diamonds for Dessert, and you have to go visit this blog to see all of the other amazing cookies this woman has made. She even includes adorable little illustrations for creating each animal. I hope you enjoyed the first "Pin It Wednesday". I think it will be lots of fun to find treasures to share with all of you. Stay tuned for Point of View pillow features tomorrow. If you're interested in seeing my other recipe pins, click HERE. Interested in seeing all of my Pinterest boards? Click HERE. No clue what Pinterest is? Click HERE. Didn't know you were on Pinterest too! It is addictive, isn't it? Just started following your boards. Looking forward to seeing more of your pins. I have a on-again, off-again obsession with Pinterest. Right now, we're "on again." Great idea for a weekly feature! I'll be looking forward to reading! Great idea!! I too am obsessed! I. Can't. Stop. Pinning. Yeah, I just got into Pinterest and I too am OBSESSED! :) So many great ideas!!! Now I've gotta figure out how to follow you.. Yes!! I just posted today on how I joined the Pinterest craze this past weekend. I added over 200 pins from stuff I've had sitting in my inbox. Love it, I'm following you! Pinterest is so much fun and such a good way to safe beauty you want to see over and over again! I saw the bread bears too, but they looked to complicated for me so I never tried looking at the instructions! HA! I love this idea, Gwen! pure brilliance! And since you have such fantastic taste, I'm sure to find things I'll have to go re-pin myself. Pinterest is so addicting! Love the new series. I've really wanted to get into Pinterest but I can't seem to get the tool think up on my toolbar by dragging it so I've kinda given up! I LOVE the little teddies in the cups! Love this posting idea and these cute food ideas. I haven't tried pinning, but I really like the ideas that people have shared on yours and other sites! Gaah! adorable!! Saw those on your boards...the turtles are the cutest! Ooh, what a fun new idea! Those treats are amazing! Some people have the best imaginations don't they, to create food looking like this! Gwen I love your new photo of yourself..it makes you look a lot younger and prettier than the other one. Seriously there are so many amazing things you can find on pinterest. It it one of my favorites places right now. These are all so adorable! ON MY goodness these are so amazing especially the pantone cookies! So super cute ! Pinterest just rocks..hope you are keeping well !